When the ILC hopefully comes to Iwate it will be in the vicinity of a few decent-sized cities. Ichinoseki (2014 pop. estimate: 122,000) and Oshu (120,000) will be the hosts and the more concentrated Hanamaki (95,000) and Kitakami (93,000) are within an hour’s drive away. They will be able to supply good restaurants, shopping centers, department stores, cinemas, bars, and other forms of entertainment. A UNESCO cultural site at Hiraizumi and a good ski area with snow aplenty at Geto are in that same accessible sphere. However, humans have desire to explore, a wish to select and purchase from a greater variety of products, an innate need to explore with one’s leisure time, and in more succinct terms, a drive to experience different activities on occasion. When this wanderlust arises, the most logical place to go will be to Iwate’s prefectural capital, Morioka and its environs. Approximately 65 kilometres away, the Tohoku expressway will get one there from the ILC area in a little less than an hour, the commuter train, a little bit more than that hour. A bullet train can do the job in fifteen or twenty minutes without getting anywhere near top speed, and a Sunday drive on Japan’s most traveled highway will have you there in a the 90 to 120-minute range. Simply put, to me Morioka represents the “crossroads” of Japan. It encapsulates where cutting-edge, uber-modern Japan faces its feudal past. Where urban and cosmopolitan are surrounded by rice fields, hamlets, lush forests, and craggy mountains. Where traffic jams and shopping malls give way to bear sightings, volcanic hot springs, and orchards the next town over. Quite possibly, it is the largest town of consequence between Sendai, Japan’s eighth largest city, in Miyagi prefecture, and Sapporo, the main city of Japan’s northern island Hokkaido. At worst, Morioka duels similarly- sized Hakodate, the port city at the Southern tip of Hokkaido for that title. Its central location makes it an ideal conduit for commerce coming from Tokyo and Sendai heading west to Akita prefectures capital Akita City, north to Aomori’s capital, Aomori-City and northeast to Aomori’s port city Hachinohe. In fact, before the expansion of the bullet train’s reach during the past fifteen years, Morioka was indeed the “shuuten” or “last stop” for all bullet trains going north. Is Morioka big enough to meet up to the capricious whims and sensibilities of London-ites, Los Angelenos, Romans, Bostonians, and others accustomed to living in the major cities of the world? Of course not, but let’s be fair, few places in the world can provide that. 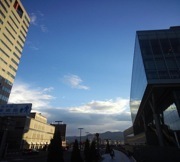 Morioka provides just enough of that lifestyle to satisfy cravings for the urban and upscale. Morioka is comparable in size and population to cities such as Honolulu and Anaheim in the US, Brno, Bologna, Bonn, Canberra, the metropolitan areas of Zurich and Nice, and its Canadian sister city, Victoria. It can provide enough of the accoutrements of city dwelling to eliminate the need for weekly trips to Japan’s major cities like Sendai (a two-hour bus trip away), Tokyo (two hours by bullet train), and the Osaka/Kyoto/Kobe corridor (about an hour away by plane). Morioka gives one a wide and delicious variety of restaurants serving fare from around the world and also plenty of local treats worth trying. To underscore this point, not only does Morioka have about a half-dozen each of the ubiquitous chains Starbucks, McDonald’s and KFC, it has nearly a dozen places where you can sample authentic, Indian/Nepali cuisine. In addition you will find two huge multi-level malls, and several large department stores exist to meet shoppers’ needs. The city centre, like many across the developed world lost out its shopping pre-eminence to the large box stores taking root in its suburbs. The city planners adroitly re-invented it as its urban playground with hip novelty stores, restaurants aplenty, revamped movie theatres, coffee shops, dance clubs, bars, a weekend pedestrian mall in good weather, and plenty of special events to attract customers. It even has a few book sellers who have decent selections of foreign language books and magazines. It will not be impossible to find the latest issue of The Economist or Sports Illustrated, or a best-seller off the New York Times list. For those adventurous visitors who do want to dive into Japan’s storied and historic native culture, Morioka has plenty to offer. The city park is built around the ruins of a feudal castle. Shrines and temples dot the landscape, including some with easy access from the main part of town. For four days in the summer, the world largest taiko drumming exhibition takes place at the Guinness world-record holding Sansa Odori dance festival. Being little more than two hours from both the Sea of Japan and the Pacific Ocean, there is a good chance the sushi and sashimi you are enjoying today was swimming yesterday. If you want to move beyond a pint of Guinness and a decent plate of nachos (Morioka has a place that will serve you both! ), why not head to a traditional Japanese izakaya watering hole and sample rice wine (sake), salted soybeans in the husk (edamame), and some of the local fish, vegetables, and meaty treats. Before I came to Japan I never thought I’d eat pickled jellyfish, let alone ask for seconds. Now that we have established that Morioka is a little more substantial than the proverbial “cow town”,I’m sure your next question is: “What about the great outdoors? Where is THAT?” Well, it literally surrounds Morioka. The Ou Mountains which are the western border of the prefecture dot the horizon. Including Mt. Iwate the third tallest in Tohoku, a mere twelve miles away. The Kitakami River, Japan’s second longest contributes to a confluence in the center of town. Lake Tazawako, Japans deepest, is a mere twenty miles away, just over the border of neighboring Akita prefecture. Needless to say, alpine cross country, and telemark skiers, ice skaters, snowmobilers, hikers, campers, hunters, fishermen and women, jet skiers, wake-boarders, boaters, outdoor enthusiasts and dilettantes of all types will find places to play. For those who hear the calling of the ocean, it will be close enough to answer. The eastern border of Iwate is the Pacific Ocean, with most coastal towns within two or three hours of Morioka by car or train. The Sea of Japan borders neighboring Akita and is only slightly further to reach. Though not a surfer myself, I do know of plenty who have found some decent Iwate surf to explore. I am a sushi enthusiast, and can promise you the best I ever had was on the Iwate coastline, probably because it was most likely swimming earlier that day. Of course, the Iwate coast is rebuilding from the tsunami of March 2011, and it provides many worthwhile volunteer and philanthropic opportunities. To the foreign visitor, the two biggest gems, aside from Mt Iwate, which towers over Morioka the same way Mt. Fuji does to Tohoku, near Morioka would be Koiwai Farms and Appi Ski Resort. Koiwai, in Shizukuishi, which borders Morioka, is one of Japan’s leading producers of high quality dairy and agricultural products. In addition they have created a combination of restaurants, exhibitions, gift shops and a petting zoo on their scenic property. It is a truly appropriate place to take either a date or your children. Think of it as a Japanese version of Ben-and-Jerry’s factory tours, the biggest tourist attraction in my home state. Appi, which is about twenty miles from Morioka, is a ski resort that consistently finds itself on top-five lists for both Japanese and Asian ski resorts. They have a very good business model, having seen that investing money in the resort will come back to them in consumer visits and money. On any given day there you will hear not only Japanese, but also plenty of Chinese, English, Korean, and even some Russian, being spoken by their numerous foreign visitors. Of course the outdoors in Iwate would not be complete without the “onsen” or volcanic hot springs that dot the landscape. They are probably also the most popular with domestic tourists. Though I still don’t understand the Japanese habit of a mid- summer soak in hot water, I can vouch for the sublime treatment your aching muscles and psyche will get from one from September to May or June. Morioka may not be the epitome of big-city living nor nature in its infinite splendor. However, it will supply enough of both to provide a good place to live and recreate, and can be a good candidate city to live when ILC comes to Kitakami. Impressive Dean!!! I have made a hard copy so I can spend some time with it.